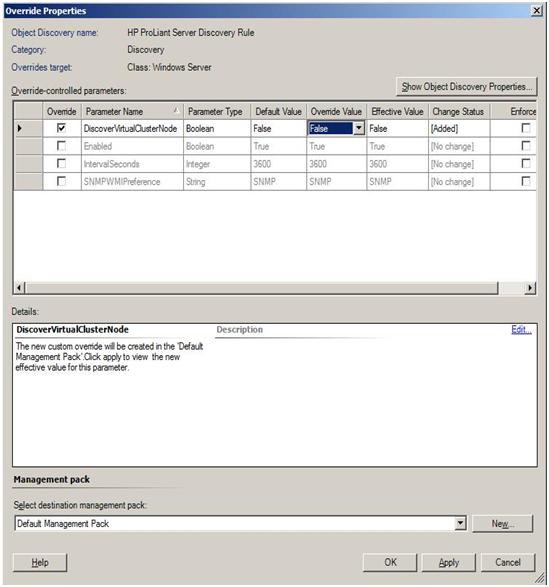 The HP ProLiant Server Management Packs for Operations Manager 2007 include many discovery rules in different management packs. HP Computer Discovery (ID=HewlettPackard.Servers.HPComputerGroupDiscovery)--This rule discovers HP servers and classifies them under the HP servers group. Only physical node servers are discovered by this rule. Virtual cluster nodes and non server client nodes are not discovered by default. The virtual cluster nodes can be viewed by overriding parameter DiscoverVirtualClusterNode, setting it to True. Discovers systems running non-server Windows (e.g. ProLiant Workstation Blades).This discovery is disabled by default. To view the client systems running non-server windows enable this discovery. Discovers HP Systems Insight Manager on an HP ProLiant server. Discovers HP Systems Insight Manager on an x64 HP ProLiant server. Instantiates HP ProLiant Servers group under HP Servers group. Select Management Pack Objects>Object Discoveries. A list of Object Discoveries appears. 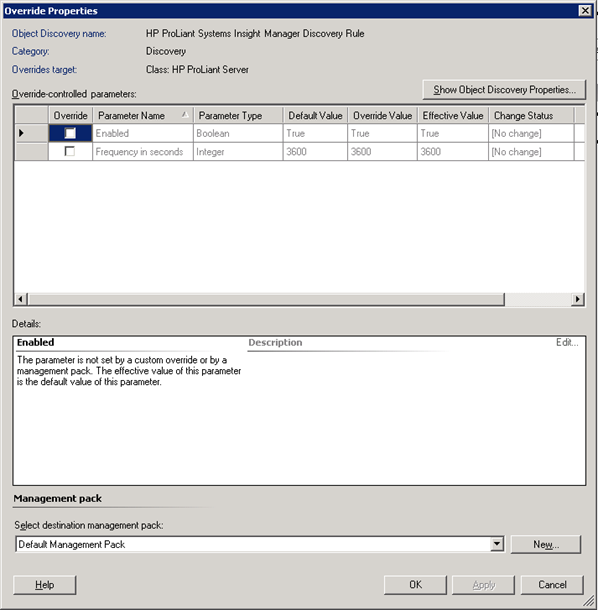 Select HP ProLiant Server Discovery Rule or HP ProLiant Systems Insight Manager Discovery Rule. In the Actions panel, select Overrides>Override the Object Discovery>For all objects of type: Windows Computer. The Override Properties window appears. For the HP ProLiant Server Discovery Rule, the "IntervalSeconds" parameter can be modified to adjust the discovery frequency (in seconds). 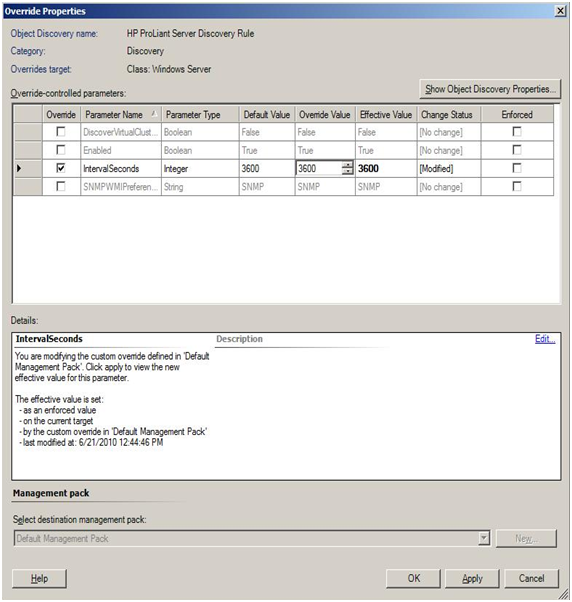 For the HP ProLiant Systems Insight Manager Discovery Rule, the "Frequency in seconds" parameter can be modified to adjust the discovery frequency (in seconds). To disable discovery, the same previous steps can be taken. Instead of selecting Override the Object Discovery, select Disable Object Discovery. Select HP ProLiant Server Discovery Rule. Override the object discovery for all servers. To view virtual cluster nodes, override the parameter “DiscoverVirtualClusterNode” to True. Select and right-click HP ProLiant Server Discovery Rule and override the parameter enabled to true. HP ProLiant SNMP Health Collection Discovery Rule (ID=HewlettPackard.Servers.ProLiant.SNMP.ProLiantSNMPHealthDiscoveryRule)—Instantiates Health Collection classes associated with HP ProLiant servers (This discovery rule runs every 60 minutes by default). HP ProLiant WMI Health Collection Discovery Rule (ID=HewlettPackard.Servers.ProLiant.WMI.ProLiantWMIHealthDiscoveryRule)—Instantiates Health Collection classes associated with HP ProLiant servers. This discovery rule runs every 60 minutes by default. 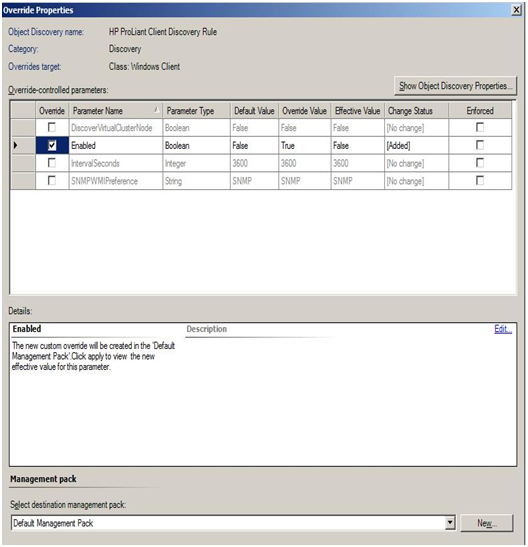 The discovery rules in the HP ProLiant Server Management Packs for Operations Manager 2007 help to discover and automatically classify HP ProLiant servers into their appropriate group and Health Collection classes.